The Duke and Duchess of Cambridge visited a helpline service run by YoungMinds to help tackle the stigma associated with calling support services and encourage those who need help to seek it. Their Royal Highnesses were given a taster of the training that equips helpline volunteers to provide support to those who call. And that training can help all of us support friends, family members or colleagues who might need a bit of support. 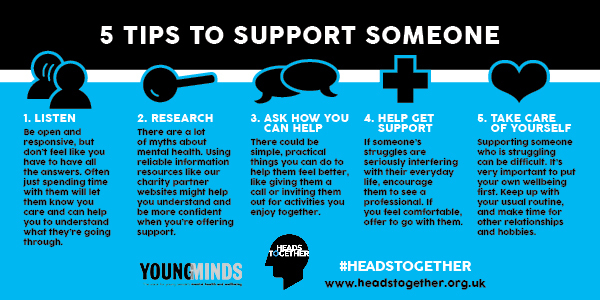 We have put together some top tips to help us all help each other. Download them and share them with others. The YoungMinds Parents helpline offers support and advice to any adult worried about the emotional problems, behaviour or mental health of a child or young person up to the age of 25. During their visit, Their Royal Highnesses met some of the people who volunteer with the helpline to find out more about their experience and what motivated them to get involved. They then got a taster of the training that people receive to become a volunteer including learning about helpline skills. This taster training session allowed them to gain a better understanding of what callers will experience if they contact the helpline. As part of the training, the Duke and Duchess also listened in on some of the calls the helpline received during their visit and heard first-hand how volunteers handle enquiries before sitting in on a debrief session. This was an opportunity for volunteers to discuss how they handled the call and also receive feedback to develop their volunteer skills going forward. For many people, a barrier to seeking help when they need it is the lack of awareness on who to contact, who they will be speaking to and fear of what will happen next. This visit was an opportunity to dispel some of the myths surrounding helplines by profiling the kind of people who will be at the end of the line as well as well as the types of questions and responses people can expect if they call. Thousands of young people across the UK will this wee received their GCSE exam results. This can be a particularly difficult time for students, as well as their parents, who are worried about the impact their results can have on their future. Whether it’s coping with the pressure of exam results or coping with a difficult time, everyone needs support from time to time.